Our preschool is located in a wing of the church designed specifically for young children. Classroom spaces are well-lit and were designed with kids and families in mind, as evidenced by a child-sized bathroom and sinks, easy-to-clean-surfaces and an enclosed playground. We emphasize the hands-on approach for all of our learning experiences. We support a developmentally appropriate program which allows children to grow and develop at their own rate. Learning, growing, and sharing in God’s love is at the heart of St. Mark’s Preschool philosophy. We believe that early childhood should be a time of fun, warmth, security, exploring and discovery. Preschool children are creative and open; our staff strives to nurture and encourage these qualities in the children who attend our school. 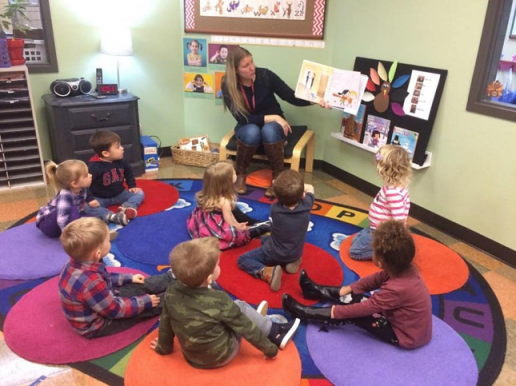 We use three distinct curriculums at St. Mark’s Preschool. The first is Second Step Early Learning to teach social-emotional skills. When children possess the self-regulation and social-emotional skills taught with evidence-based Second Step Social-Emotional Learning, they’re set up for success. The second is Zoo-phonics. A multisensory language arts program that is a kinesthetic, multi-modal approach to learning all aspects of language arts, including vocabulary development and articulation, based on phonics and phonemic awareness. We begin Zoo-phonics in the 3s and 4s class. We also use the Handwriting Without Tears curriculum to help our students develop appropriate handwriting habits. It uses developmentally appropriate, multisensory strategies for early writing. The program follows research of how children learn best and includes materials that address all styles of learning. We also strive to foster a love of learning and growing by sharing great books, music, math and science concepts and engaging in gross motor play. We love to provide opportunities for the following as well: art activities; games and fine-motor activities; exposure to colors, shapes, and numbers; nature activities; field trips throughout the community; baking; chapel and celebration of birthdays, holidays, and cultural events. We are proud of our strong sense of community! Many of our family events occur in the evenings. We typically have a Fall Performance in November, a Sing-Along & Sweets in December, a Spring Sing in March and an End-of-the-Year Party in June. We also have daytime celebrations such as class Christmas parties, Valentine’s Day parties, Mother’s Day and Father’s Day events and a PreK Graduation. We hope you will give us a call or come by to tour our classrooms and meet our teachers! The Preschool’s Main entrance is in the lower parking lot. From N. 17th St. turn onto Lenore St.
We have bright, welcoming classrooms with lots of room to learn and play! Child-friendly restrooms are located on the same floor, and we have in-room wash-up sinks to clean up after our fun (and often messy!) art-projects. Our children also get lots of fresh air in the on-site playground.